It is almost the weekend once again here in fabulous Big Bear Lake and despite some possible rain today, the weekend looks absolutely spectacular with high temps around 70° and lots of sunshine. Beat the June Gloom of the city and head up to clear blue skies!! This weekend, Big Bear is filled with things to do: Boating, Kayaking, Fishing, WaterTubing, Mountain Biking, Hiking, Ziplining, Helicopter Tours, Pirate Ship Tours, Off-Road 4 x 4 Tours, Segway Tours, Bowling, Water Slide, Ice Skating, Shopping, Stargazing, Zoo, Golfing, Alpine Slide, Live Concerts, Museum, Discovery Center, Sky Chair, and so much more! 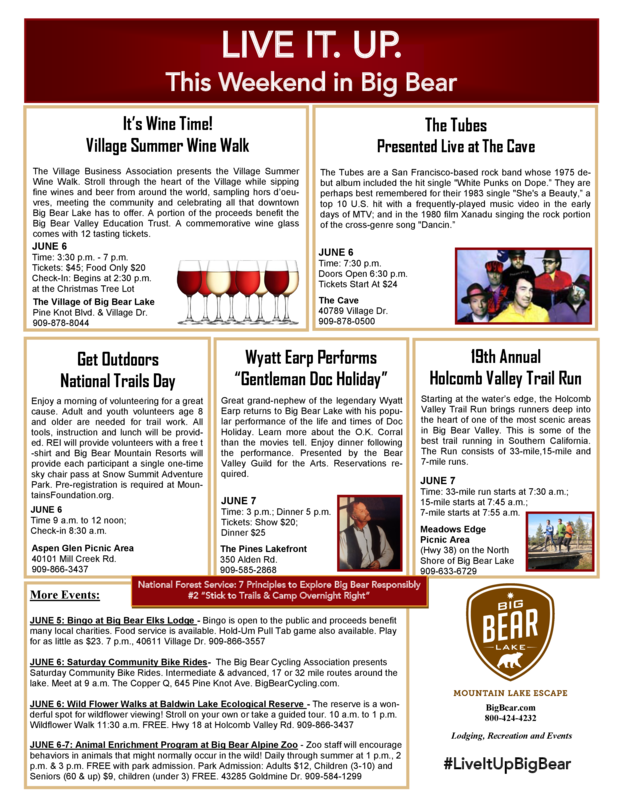 There are also several Special Events happening such as: The Big Bear Village Summer Wine Walk, National Trails Day, The Tubes in Concert, Holcomb Valley Trail Run and more! Check out the Flyer below for all the details. There is so much to do at 7000′! !